Our clients are the best! their sweet words make us blush - read them below! Caroline was by far and away our favorite vendor. She created our amazing wedding suite, along with our day of goodies (fans, menus and place cards made of leather!). 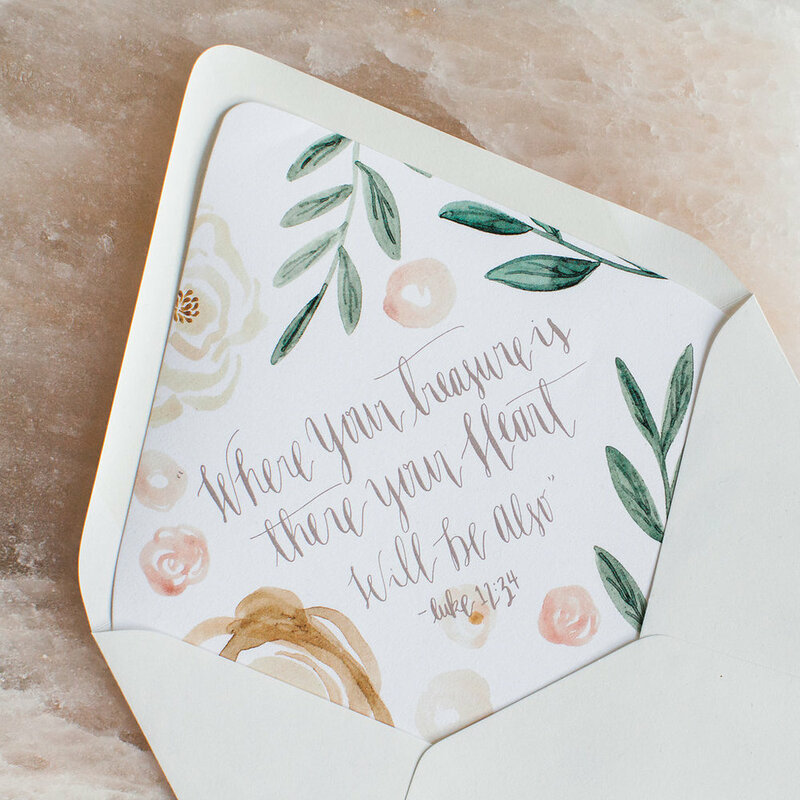 From the moment I spoke to Caroline I felt like she was someone I had known forever, she is so kind and caring and truly invested in creating the perfect paper goods for you and your partner. I was in love with one of her wedding suites that I kept coming back to her on my search for a perfect designer and part of me wanted her to just recreate it because I didn't think anything could be better, but her genius is that she is able to create something that is truly unique and representative of your relationship. No two suites are the same, nor should they be! She really gets to know you and it comes out in volumes in her beautiful work. She is also an amazing collaborator. She never got sick of my many, many emails with inspiration or comments. For me, the invitation was one of the most important elements of our wedding. I knew that this would be the first impression that our guests would have of our wedding and she truly exceeded our expectations in every single way, from the entire design process to the finished products. The response to our invitations was incredible. Almost every single person that received our invite reached out to me by text, email or call to say how much they loved them. My father cried when he got our invitation (and he does not cry often). He couldn't believe how perfectly our invitations captured us. He also carries around our fan (that we placed on everyone's chairs at the ceremony) in his briefcase and still shows people months after our wedding! Let me start by saying that, I had no idea how lucky I was to find Caroline and how gifted I was for her to chose my wedding as one of her summer suites. It was a complete match made when I found her. To start the process I filled out a questionnaire so that Caroline could get a descriptive idea of my husband and Is relationship as well as the theme of our wedding. After she had some time to process the material we had a phone interview to collaborate and I felt like she immediately got me!! Out of all the vendors I had for my wedding, Caroline was by far the most accommodating, drama-free, artistic and most importantly fun. Every time I spoke with her she was such a breath of fresh air. I felt like she pulled my vision and made it a reality. She made my invitations, RSVP cards, Favor paper product, menus, programs, place cards, and coasters. I guess you could say I couldn't get enough of her designs, it became a total addiction. Caroline organized my vision and made me fall in love with her design suite. She will forever be my Go-to when it comes to paper products. Everything she touches turns into GOLD. There aren’t enough compliments in the world I could give to Caroline and her Lovely Paper Things! The only thing better than her wonderful designs, is her sweet personality. Caroline was a delight to work with and did an amazing job in helping us realize our vision for all of our wedding paper goods! She is a true artist, and her Lovely Paper Things were a perfect fit for us as a couple and our wedding style and theme! I can’t wait until the time comes when we need more Lovely Paper Things! Where do I even begin? I was lucky enough to meet Caroline through our wedding planner Carly, of Carly Rae Designs. From our very first conversation, I knew there was something special about Caroline. She is incredibly vivacious and her energy is infectious! She made the entire process so FUN, and I can’t stress enough how important that was to me, especially during a stressful few months of planning! I don’t know how I could ever pick a favorite item from all of the goodies that Caroline designed for our wedding, from the custom, hand-stamped wax foil seals on the back of our envelopes to the perfectly mismatched green vintage stamps that she spent hours sourcing, everything was fantastic. Our guests would not stop commenting about our suspended, hand-lettered seating chart and I secretly cried when I saw it in person, because it was THAT incredible. Looking back now, I don’t think it would be fair to say that Caroline goes out of her way to make her clients feel extra special. I think that she just naturally CARES about people, and her client’s happiness brings her true joy, and THAT is what makes every handcrafted piece so amazing. Caroline’s style is so unique, and her artistic abilities completely exceeded my expectations. Caroline is a true gem, and I can’t wait for another wonderful reason to work with her again! I cannot say enough wonderful things about Caroline and Lovely Paper Things. Caroline is one of the sweetest human beings on the planet and I was so blessed to have found her during the planning process. She not only is insanely talented, but truly connects with her clients so she can represent them perfectly on their big day. My husband and I had an incredible wedding that revolved around a story of losing a very special ring at the beach and my husband’s adventure on making sure he found it. He did. Caroline made sure our story was shared to our guests through beautiful details and design. She made our wedding feel so personal and unique, not to mention her ideas were breathtaking. We still receive compliments on our wedding to this day. Anyone would be lucky to work with such a wonderful, charismatic, and talented young woman like Caroline and I’m lucky to now call her a friend. When I originally began my invitation process I had visited numerous stores and was dissatisfied after feeling they did not see my vision. I then reached out to Caroline who not only took my idea and made it come to life but she exceeded my expectations and made it better than I could have ever imagined! She is able to customize it so it feels like you! I had so many phone calls and texts from family and friends once they received the invite saying “WOW, it reminds me of you two and it is so perfect for your wedding.” Caroline is very talented and I would recommend lovely paper things if you want a truly unique invitation that reflects your style! Where to begin! Caroline was amazing to work with. She custom designed and created everything from the invitations to the menus to the backdrop for our wedding - basically all of the Lovely Paper Things! We could not have been more thrilled about how beautiful and memorable everything turned out and tied together. She really took the time to get to know us and our style, and even our guests commented on how all of the details reminded them of our relationship. A few of them actually ended up framing the quote we used as part of our invitation, which goes to show how special they were and how much thought and time Caroline spends creating something perfect for each of her unique clients. We truly feel like she went above and beyond for us, and it was so appreciated on our part. Looking back, working with her was probably our favorite part of our wedding planning because she made everything so easy for us and was completely reliable. We would recommend Caroline to anyone and hope to tap into her creativity again in the future.